Patience isn’t just a virtue, it’s an action that takes practice by the minute! When we’re working with other people lets try to be mindful of the miraculous life cycle a seed takes before it breaks through the ground and is visible. This is a powerful challenge to take on in every area of our lives, especially those that work with children. Remember one frustrating “moment” for you as an adult can negatively impact the “future of a child’s potential”. 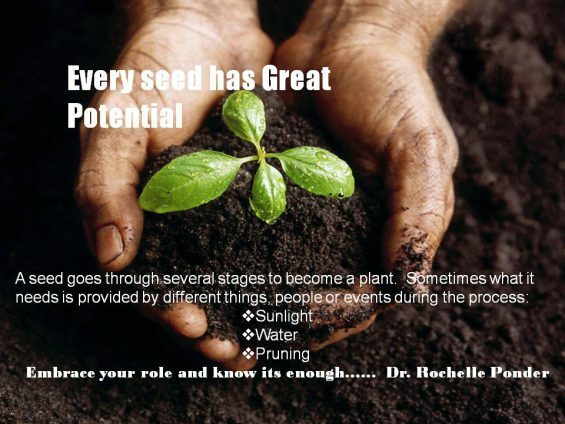 Let’s strive harder to be more patient with everyone and remember every phase of the seed germination process is equally important to it developing into a healthy mature plant that can sustain life in varying formats (ie: oxygen, beauty as a flower, food for energy, healing in medicinal practices, etc). Whatever outcome you wish to see, plant it and be patient; you may not see it immediately but know you’ve done your part.